For those who are planning to buy or upgrade a SanDisk memory card, flash drive or even a SanDisk SSD drive; now (Black Friday and Cyber Monday) is a great time to buy a SanDisk memory or storage drive. 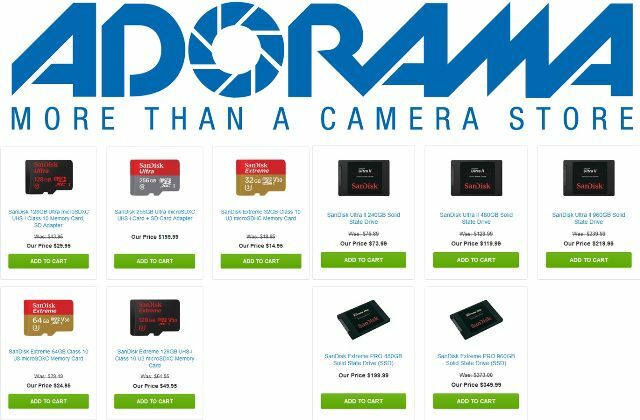 Huge discounts are being offered on various SanDisk products at Adorama. Personally, I’m pretty much excited about these deals, specially the SanDisk Extreme 128GB micro SD card for only $49.95 instead of $65, and the SanDisk Ultra II 960GB SSD now only $219.99. Note that this SanDisk Black Friday deals (at Adorama) all come with free shipping, but the promotion is good until November 28, 2016 only. So better check out the list of products below before it’s too late. Note: For your convenience, here’s a link to all discounted SanDisk products at Adorama.com for the Black Friday deals. Lenovo Deals and Coupons for November 2018 – Black Friday Sale Begins! Samsung Deals and Sale for November 2018 – Black Friday Deals Begins! Microsoft Windows 10 Professional for only $14 USD & Free shipping! © 2019 ThePCEnthusiast.com - All Rights Reserved.